TRULY remarkable miraculous powers Aru Islands in the Moluccas. The Europeans since the 18th century already visited the place. 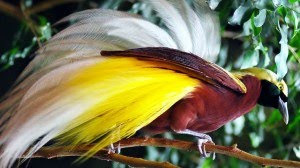 In fact, the diversity of flora and fauna inspired a biologist, Alfred Russel Wallace, wrote his The Malay Archipelago (1932). The trail stopover European people can still be found there. For example, relics of the Old Town on the island fortress Wokam. Fort that still leaves traces of the building, although some parts were cracked and collapsed. 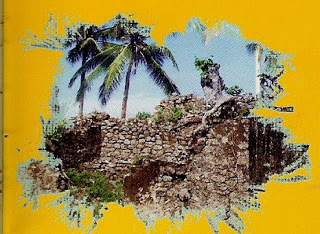 "This Portuguese fort, which is evidence of the history when the struggle for independence first," explained Destha T Raharjana.Destha be one member of the expedition Center for Tourism Studies (Puspar) UGM to the Aru Islands. Other team members, and Kurnia Wijaya Ladampa. In some other parts, they found some evidence of the building which has a function of the time. Such functions as a warehouse, kitchen, or a place to rest.Aru area, said Destha, also known as the producer of the dollar due to its natural wealth. Destha and his colleagues are also interested in the Canary Islands. "This is one of the Aru Islands which became the cultivation of pearls," she said. In this island archipelago Pearl is a pearl cultivation on a large scale are marketed to foreign countries. "Look closely at the snails pearls are cultivated and processed there, it is very attractive for tourists," said Destha.Old QuranKampung Waifual Kola Island, a place of interest. "This is an old village, which is believed to be one embryo formation Aru Islands region as a whole," said Destha. One proof of heritage of the region, this is an old Koran. But unfortunately things can not be seen directly. "Kampung Waifual a cultural and historical attractions are interesting to visit," concluded Destha. Different if the visit to Kampung Ujir Ujir Island, also known as the hometown of the oldest Islamic Aru Islands. Islam arrived in the island that is the first time and there is an old book of Koran dozens of centuries old. Evidence that legacy can be seen at the residence of local religious leaders.From Kampung Waifual, the journey can continue to Kampung Langhalau. Here too there are many historical relics, such as where the original betel-shaped urn made of ceramic. Historical objects is not stored and cared for properly. The team's expedition of Puspar UGM and suggested the need for attention to the relics of history.Moreover, in this village there is also a stone coffin and grave screen as well as the already tangible cubes. According to the story, the place is supposedly made up of myths that developed. Previously, this place is very sacred, so not many people came to visit. But now this place has been attempted to be visited by the people, and see its natural beauty and authenticity. "On the island Leting, there is seaweed farming for a living society. Marketing but they are constrained," said Destha again. There is another village and there Kolamar historic relics jars and plates hundreds of years old. In general, old jars used as a place to store the items of jewelry in ancient times. Then the beautiful island of Toba. "People can fishing, boating, swimming, watching its beauty," said Destha and other members of the expedition team.For them, exploring the islands and the villages in the Aru Islands, visiting countries like magic to the world of tourism. There Warialau Island, Island Hemorrhoids, Ujir Island, which has not been widely known. "If we come to the Aru Islands, we can get a million stories and valuable experience," said Destha, diiyakan colleagues.